In the K-12 setting, multi-tiered models have emerged over the past 10 years to address academic and behavioral student issues. Various models (e.g., Response to Intervention or Positive Behavioral Supports) have been developed using a multi-tiered framework in an effort to be proactive and reduce special education referrals. Key components in this framework include teacher training, universal screenings, early intervention, on-going assessment, and use of evidenced-based practice. A review of the recent literature did not yield any studies related to the application of a multi-tiered model at the post-secondary level. This chapter describes the design of a multi-tiered support model for use at the college level. This proposed model utilizes a peer tutoring/mentoring program and other college support services. It is designed to coordinate campus services and provide various levels of support for incoming students at Bowie State University, especially those with pre-existing learning, behavioral and mental health issues. 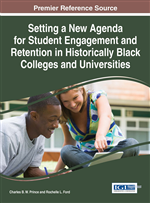 This chapter describes how the Department of Psychology at Bowie State University (BSU) is collaborating with the university community to design a unique multi-tiered System of Support model (SoS model) to address academic, social- emotional and behavioral needs of incoming freshman at this HBCU. A brief description of the model will be provided followed by a general summary of its key components. Using specific examples from this project, a description of how the model is modified to address the needs of the department will be given. The authors will delineate how academic issues such as time management, learning styles, study techniques, and test-taking skills will be addressed using the model. In the area of social- emotional and behavioral issues, the authors will describe the use of the model to address issues such as depression, anxiety, and stress.